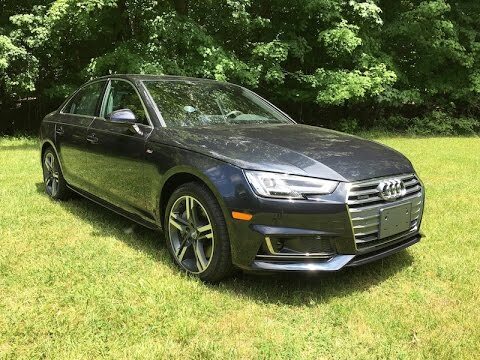 There's a lot riding on the 2017 Audi A4, and make no mistake, Audi is keenly aware of this. So it has stuffed the new A4 to the brim with cutting-edge, class-exclusive technology, increased the power, sharpened the styling and improved the driving experience. It will bring in new buyers, without alienating those who already love the A4. In general I would say that this is a very good car. And the service provided by the company is also very good: people are always responsive and in any case any pieces are always available. The car is very elegant, and presents very well in any work or professional setting. Plus the prestige derived from the manufacturer is always a good plus. The car is not enormous, so it is not useful for any road trips or anything. This is, in my opinion, a strictly city use automobile. Overall, I would say that I am very satisfied with my purchase! You can drive it in both a "D" or an "S" mode, although I'm not even certain how to get into the "S" mode. I like the the look of the vehicle, both inside and out. The package on this vehicle is not as comprehensive as my last vehicle, and I miss my blind-spot detector. Also, my son's wheelchair accessible minivan, has more/better technology than this luxury vehicle. The minivan will read my texts to me...my Audi will not. We're leasing and love that the lease covers maintenance. We having had any issues with the car, besides the battery always dying with the keyless entry/remote. We love that there is a seat memory so both of us can drive and not face to fiddle with seat settings. It caters nicely to tall and short drivers.